Most trees and shrubs that grow in temperate regions, where there are clear alternations of seasons (cold – warm, or wet – dry) produce annual rings in their stems or roots. 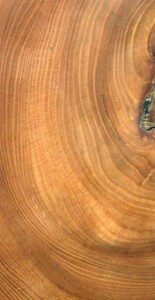 Annual rings come about because there is a difference in the “wood cells” (xylem : see below) formed when growth is fast, as in the Spring, or slow, as in late Autumn. This is in marked contrast to the trees or perennials of wet, tropical forests where the climate is more uniform, as is the wood formed. The rings formed in beech, birch, lime and oak are generally quite conspicuous / distinguishable. They may be counted (when a tree is felled) to give an indication of the age of the tree. The relative thickness of the various rings is also a reflection of the various climatic and environmental factors that influenced the tree during its life and the formation of the wood or xylem tissue. Both the xylem and phloem are conducting systems within the tree, and the cells for both are formed by the cambium. This is a ring of tissue within the stem or root. In the Spring, the cambial cells become active and divide (by mitosis). The cells formed on its outer surface gradually change and form the tubes of the phloem. These will conduct sugars (formed in the leaves) to storage organs or growing regions. 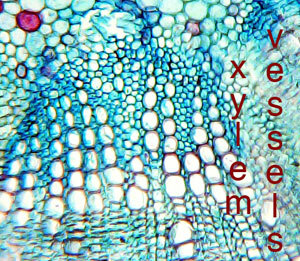 The cells formed on the inner side undergo profound changes to form the water conducting tubes of the xylem. The once living cells from the cambium lose their cell contents, and their cell walls become impregnated with lignin. Lignin is the ‘stuff of wood’; it is a complex polyphenolic compound, it combines with many other substances (hemicelluloses, pectates) to form a material that is not only ‘waterproof’ but also highly resistant to decay. The lignin lined tubes of the xylem (or xylem vessels) transport water and minerals from the roots through the root and stem, up to the leaves. The vessels that are formed in the Spring are generally much bigger in diameter than those formed later in the year. It is this difference in size that gives rises to the ‘banding’ or rings in the xylem or wood of the tree or shrub. Dendrochronology is the study of annual rings and their variation, and it has been used to ‘date’ various historical artefacts (of which, more another day.....).